Click on the links below to view and/or download OHRC publications. There are no print copies available at this time. OHRC publications, such as fact sheets, resource bulletins, and resource guides, may be photocopied; adapting or reproducing OHRC-produced materials requires permission. If you would like assistance, contact us. Educational materials in English and Spanish. Written in an easy-to-read style that is appropriate for all audiences, including those with lower literacy levels. Tips for Good Oral Health During Pregnancy is excerpted from Oral Health Care During Pregnancy: A Consensus Statement. 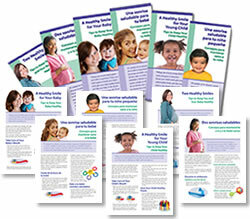 It is a two-page handout for pregnant women. Also available in Arabic, Chinese, Chuukese, German, Korean, Portuguese, Russian, Samoan, Spanish, and Vietnamese. Be an Oral Health Champion. Also available as a poster. Tips for Good Oral Health During Pregnancy. Also	available	in Arabic, Chinese, Chuukese, German, Korean, Portuguese, Russian, Samoan, Spanish, and Vietnamese.